The death of Osama bin Laden was the biggest story measured in any single week since the Pew Research Center’s Project for Excellence in Journalism began tracking mainstream media coverage in January 2007. Coverage of the May 1 raid in Abbottabad, Pakistan, and its aftermath, accounted for 69% of the newshole during the week of May 2-8, according to PEJ’s weekly News Coverage Index. That was enough to edged the media attention (measured at just under 69%) devoted to the presidential campaign from August 25-31, 2008, the week Democrats nominated Barack Obama at their Denver convention and John McCain introduced Sarah Palin as his surprise running mate. On cable television alone, the bin Laden story accounted for a staggering 90% of the airtime studied last week. In another illustration of the enormity of coverage, bin Laden was a dominant newsmaker in 28% of last week’s stories, the most media attention devoted to anyone since the week of Barack Obama’s inauguration, January 19-25, 2009. Overall coverage of the story did taper somewhat throughout the week. On Monday, it accounted for 83% of the newshole. On Friday, it accounted for 40%. Yet even at its lowest level, the subject dominated all other news events. The biggest bin Laden storyline from May 2-8 was piecing together the dramatic narrative of the mission to kill him, which accounted for 36% of all bin Laden coverage as new details—and sometimes corrections to previous details—continued to emerge throughout the week. The second biggest storyline was coverage of the political implications of the event, at 15%. But that lagged well behind the narrative thread. Even on cable news, which focuses heavily on political and partisan issues, that thread accounted for only 13% of the airtime. The next biggest storyline overall was the role of Pakistan and its impact on U.S.-Pakistan relations, at 10%. 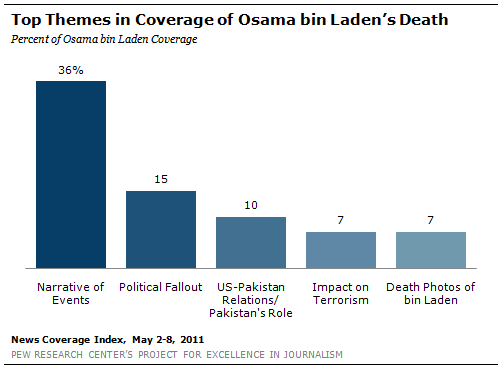 Then came the implications for future terrorism and national security, at 7% of all bin Laden coverage. Toward the end of the week, however, some aspects of the narrative began to change as the media explored new angles. On Friday, May 6, attention to the political implications of the killing accounted for over one-fifth of all bin Laden coverage. The numbers were about the same that day for Obama’s visit to the World Trade Center as well as for coverage of the broader implications for the fight against terrorism. Those were some of the narratives that finally began to supplant the tick-tock recounting of events, which made up 16% of the coverage studied that day, down from 53% on Monday. The impact and intensity of this story prompted PEJ to release a May 9 special report on the early coverage of the death of bin Laden, using computer technology by Crimson Hexagon that examined more than 120,000 news stories from May 1 through May 4. An updated analysis of Crimson Hexagon, incorporating the rest of the week, found little overall change in the mainstream media conversation about bin Laden. About a third of it focused on the events of the raid. Another quarter focused on the global reaction to the death. These and the other narratives comprising coverage of bin Laden’s death largely tracked along with PEJ’s NCI sample of outlets for the week. All this wall-to-wall attention left little room for the media to focus on anything else last week. In fact, the No. 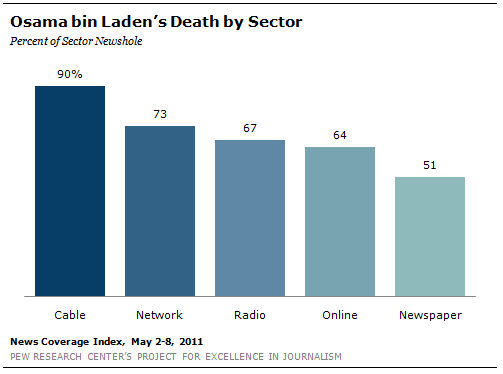 2 story, the U.S. economy, registered at 5% of the newshole, a whopping 64 percentage points behind the bin Laden saga. It was a “where were you when…” piece of news, broken on Twitter, and interrupting cable and network broadcasts on the night of May 1. The media’s craving for details of the raid and the planning that went into it translated into detailed attention to the sequence of events, down to the menu in the Situation Room the evening of the mission’s execution—turkey pita wraps, cold shrimp, potato chips, soda. The story contained one of the more widely circulated and reprinted images—a White House photo of the president and his advisors, including Vice President Joe Biden and Secretary of State Hillary Clinton, sitting in close quarters inside the Situation Room, staring intently at a screen. Other storylines continued to remain secondary to the narrative, as journalists struggled to fill in the missing pieces of what happened in Abbottabad. This absorption with the narrative of events, however, was no doubt heightened by a White House version of the story that seemed to change with each day. On May 2, the official administration version of events included a firefight between Navy Seals and bin Laden, who reportedly used his wife as a human shield. By the next day, the record had been changed to reflect that bin Laden had not fired a weapon nor used a human shield. And by Wednesday, the story was revised yet again as the administration said the raid was not a firefight, but in fact an operation that drew enemy fire only at the beginning by bin Laden’s courier. Even as the largest share of the week’s coverage was devoted to figuring out the events of the bin Laden mission, other angles did work their way into the media coverage. One of these was politics. As early as Monday evening, MSNBC Hardball host Chris Matthews asked, “So what’s the impact politically? Does this news reshape the 2012 outlook?” One of his guests, Major Garrett of National Journal, offered that the news might not trump concerns about the problems facing Americans on a day-to-day basis. “The question for President Obama, as this great event plays out, is how much is the country going to be focused on national security, terrorism, as it regards to the 2012 election, as opposed to the economy, budget and the deficit,” said Garrett. At least in the hours after the initial news, though, Obama appeared to be riding a wave of increased support. Ann Compton of ABC News reported on a May 3 radio broadcast that “President Obama is getting a significant bump up in the polls for his handling of his job and Afghanistan,” as she cited a Washington Post/Pew Research Center poll that showed Obama’s overall approval rating up to 56%. Other outlets raised the issue of what bin Laden’s demise could mean for the risk of terrorist reprisal in the U.S. An ABC World News Tonight report on May 3 illustrated those concerns with a family on vacation. “The Space Needle in Seattle today,” narrated Jim Avila. “Plenty of tourists, but the Eagle family from Forth Worth, Texas, did have to calm their son’s fear before the trip.” Most of the experts interviewed, however, suggested that ordinary Americans had little to worry about. By Sunday, May 8, a week after the raid, the bin Laden story was still a fixture on the nation’s front pages. In the Washington Post, two front page stories were devoted to the subject—one on seized footage of the al-Qaeda chief, the other on the future leadership of his terrorist organization. The New York Times ran with a story about bin Laden’s life in hiding. And the Los Angeles Times front page contained a story on what the bin Laden raid tells us about the increased sophistication of the CIA. Crowded out by the news about Osama bin Laden, the rest of the top stories almost seemed like an afterthought last week. The U.S. economy was a distant No. 2 story, at 5% of the newshole, largely due to encouraging employment statistics from the month of April. Flooding in the South and Midwest accounted for the No. 3 story, at 3% of the newshole. Also at 3% was the U.S. presidential election, with coverage driven largely by the first Republican debate in Greenville, South Carolina. Finally, the No. 5 story of the week (2%) revolved around education in the U.S. as various outlets reported on school systems struggling under the weight of layoffs, budget cuts, and inadequate student assessment policies. Indeed, all the week’s top newsmakers were central figures in the bid Laden story. Obama himself was the focus of 17% of all stories, a sizeable number in and of itself. 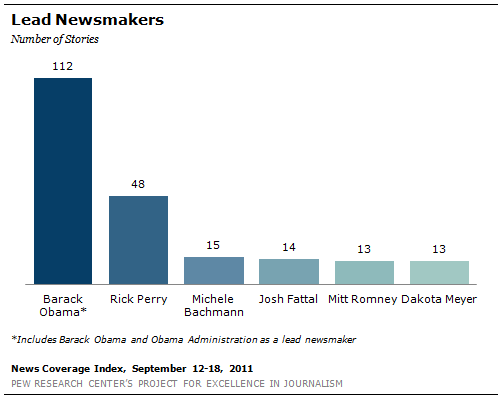 (The previous week, Obama was a dominant newsmaker in 10% of the stories). There was a major drop-off to the next tier of newsmakers which included Secretary of State Hillary Clinton (1%), White House counterterrorism advisor John Brennan (1%), and CIA director Leon Panetta (1%).